DARKSIDEadv | How to use social media to find a job ? Networking has always been a great way of finding jobs and opportunities, and with social media you can take it to next level. Social media allows you to connect with almost anyone that has a presence online, making it easier to find even more job opportunities than you would in real life. You can use social media to make relevant connections with others in your field or find potential jobs and collaboration opportunities with people that share your interests, and even to establish yourself as a very knowledgeable person in your field. When thinking about finding a job using social media, most people think about LinkedIn – since it is a social platform for professionals who want to network, it definitely sounds like the safest bet for looking for jobs. However, there are other things that you can do and other social networks that can be of just as much help. It’s also important to consider the fact that while social media can definitely help you find a job, it can also really affect your job search in a negative way. The first thing you have to do is make sure your social media profiles (and I mean all of them!) are complete and look the least bit professional. Make sure they provide all the relevant information about you, especially your academic past and your previous work experience. Your profile picture is also very important, and will probably help you a lot if you’re not holding a pint in your hands and with your hair disheveled. More and more employers and increasingly checking their prospects’ social media profiles to get an idea what kind of person they are dealing with and that can be a very important factor in deciding whether to hire someone or not so it would be a good idea to think twice before posting a new update or a new photo on your profiles. So, if you’re looking for a job (or even trying to hold the one you have now) it’s better to take down the things that will put you in a unfavorable light, while highlighting your accomplishments and best qualities. Another tip is to post content every once in a while that is related to your field of work, which shows that you are interested and passionate about your work. If you have the time (and the knowledge for that matter), you can try to start your own blog dealing with matters related to your work field of choice. This way you can share your blog posts on social media and also show potential employers that you know a lot about a subject, and that you get very engaged and passionate about it. You will also now have a website that you can direct people to from your social media accounts. It also shows that you have initiative and are truly interested in your work, which can make a great impression and set you apart among others looking for a job. You can also set up your own website where you showcase your work portfolio, transforming it into a CV that anyone can check out. Make sure you provide links to your blog or website on all your social media profiles so that they can be easily accessed. The best way to find new job opportunities is to network. Social media offers an easy way to meet new people and build relationships with them. Try using social media to talk to new people, engage with them through comments, shares and likes and be as active as possible. You never know when you could me someone that can help you find a great job, or even someone that can give you some great advice and support. Like and follow the companies you are interested in and join conversations about your work field to show that you are very knowledgeable about the subject and can provide real value to potential employers. You can also try to turn yourself into a go-to person by regularly answering people’s questions and by posting great content (that doesn’t necessarily have to be yours). LinkedIn is probably everyone’s first choice when it comes to using social media to find a job. The first thing you have to do is make sure your profile is perfect – a great profile image, up to date information on past qualifications and accomplishments as well as a complete list of past work experience and links to your other social media profiles and websites or blogs. To make your profile even better, you can use the Rich Media feature to “visually showcase your professional story and accomplishments” – this will definitely set you apart from other job seekers. You can also link your blog to your LinkedIn profile so that all your latest blog posts are posted in there as well. If you know some companies that you would like to work for, look for some of the people that work there and try to connect with them through your other connections, if that is possible. Start joining active groups that are relevant to your field and interact regularly with the other users. Try to also answer other members’ questions and engage with them as much as possible. You can also select to get a daily digest by email for each of the groups so you don’t miss anything. Twitter provides a very easy and straightforward way to connect with people and develop new relationships. You can start talking with just about anyone on Twitter. Unlike most other social networks, Twitter users rarely have private profiles and you can easily instigate conversations with other users. Start by following all the companies that you would like to work for and preferably engage with them. Don’t be afraid to ask them if they are interested in hiring – after all, the worst that could happen is they would say no or not respond at all. Keep an eye out for their tweets as well to see if they tweet about any job opportunities so that you can promptly respond. You can also do keyword searches to see if anyone is looking to hire in your field. You’ll find that many businesses advertise their job offers on Twitter so you never know when luck might struck. You can also use a tool likeTwitJobSearch where you simply enter the keywords in their search bar and see all the job opportunities that match your criteria from Twitter. They had over 193 thousand job offers in the last 30 days alone only from Twitter! You can also make yourself more discoverable on Twitter and more appealing to potential employers by regularly posting content that relates to your desired line of work – try showcasing your own work, such as your blog posts, and share other people’s content. When it comes to Facebook and Google+, I recommend joining groups/communities to network with people. It’s a great way to meet new people, and hopefully find job opportunities. Try to engage regularly with other members and be on the lookout for any offers. You can also follow companies’ pages and try to interact with them and get yourself noticed, just like on Twitter. 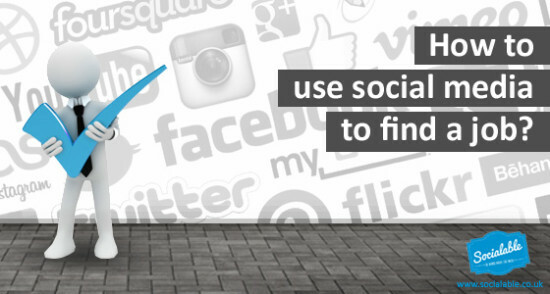 Have you ever used social media to find a job? Or to screen a potential employee? Do you think employers should base their hiring decisions based on peoples’ social media profiles? Please share your experiences and opinions below!